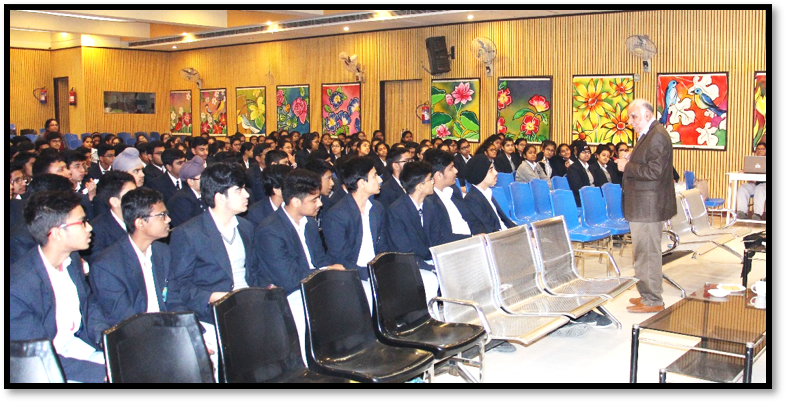 An interactive Mentoring Session was held to apprise students of class X to attempt the CBSE Science Examination. The resource person, Mr. Suraj Prakash, Director, BBPSTC, familiarized the students with the blue print of the question paper of the board exam and shared numerous significant tips to help students write the exam calmly, systematically and within the allotted time. The Psychology students of class XII went to VIMHANS Hospital on 23 December 2018 for an educational visit. 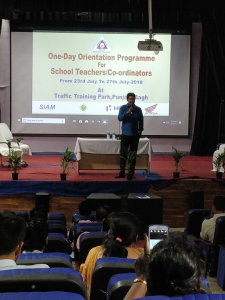 Under the aegis of Road Safety Campaign 2018 -2019 a workshop was conducted by Delhi Traffic Police on 26th July 2018, at Punjabi Bagh Traffic Training Park. It was attended by Ms.Reetu Dawar and Ms Ruchi Sethi Gupta. The workshop commenced with a short movie on road safety, followed by a talk by ASI Manoj from the Road Safety Cell. 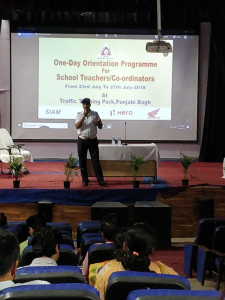 Ms. Pushpal Kaur, SI, Road Safety Cell, also delivered a lecture on how to discourage minor driving among the students and the necessity of wearing helmets by pillion riders. 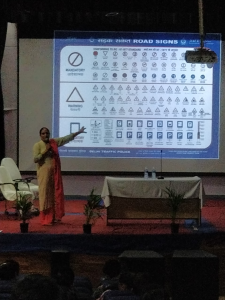 The significance of road signs, signals and markings as well as traffic rules was also explained. Various activities which will be conducted by Delhi Traffic Police during the current session were listed and explained. The role of school teachers in motivating the children to observe the traffic rules was discussed. The workshop ended with an interactive on session in which all the participants exchanged their thoughts on need, importance and means to spread road safety awareness. A workshop was conducted at BBPS Training Centre Pitampura for the teachers of Montessori Department from units all over Delhi,NCR and associated branches of BBPS.It was a 5 day Capacity Building programme from 15th to 19th of May 2017. 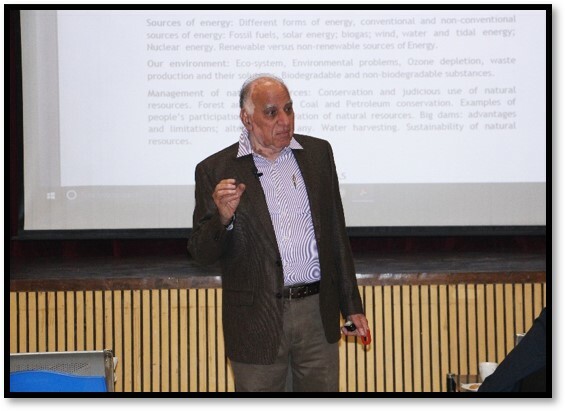 All the participants were welcomed by Mr. Suraj Prakash, Director Bal Bharati Training Centre and Dr.Romila Soni. • A theatre based workshop on motivating teachers was the highlight. Techniques to relax, refresh and replenish through meditation and effective communication were given. Certificates of Participation were handed out by Mr. S.K Bhattacharya, Chairman Bal Bharati Training Centre at Pitampura. A special workshop on Good Touch and Bad Touch was organised for the boys of Class III on 27.12.17. The workshop was conducted by Dr. Latika Bhalla and Special Educator, Ms. Neerja Bhardwaj. The students were made aware of appropriate and inappropriate touch. They were sensitised and apprised of the difference between good and bad touch with the help of a ppt and video. Ways & measures to deal with unsafe situations were also discussed. The students were explained that they must confide in their parents, grandparents or teachers in case of any unpleasant touch or experience. On 24 January 2017, the documentary film ’Zikr us parivash Ka’ on the life of the legendary singer Begum Akhtar was screened for the students of class VII in the school auditorium. It was a presentation by Sangeet Natak Akademi. The students were apprised about the objectives of the Sangeet Natak Akademi by Ms. Shruti Lal, Ms Ruby, the Resource persons from the Akademy. The film was followed by an Interactive session which concluded with students penning down their views regarding the entire session. A learn of 19 members of Anubhuti, the street play society of Janki Devi Memorial College presented a ‘Nukkad Natak’ in the school premises on 13 February 2017. Students of class VII were shown the Natak, ‘Maila Kuchaila’ which was conceptualised, scripted and directed by the Amit Tiwari. The play, attempted to sensitize students to the life of manual scavengers, their miserable living and working conditions and the inconsiderate attitude of society towards them. The play was followed by an interactive session with the members of Anubhuti. Dr. Jitendra Nagpal Moolchand Medcity. Motivational Talk - Setting Goals and Achieving Them. Structured life skills programme ‘ASPIRE’ is being run in collaboration with Envision India for classes IX and X in the session 2016-17. The programme includes six modules which will be conducted section-wise in an interactive manner. Parents are also invited to attend the same. An interactive session for the teachers of the Primary Department on 'How to inculcate reading habits in young learners' was organised on 17 February 2018, at the Pusa Road Campus. The resource person Mrs. Shikha Malhotra highlighted the importance of books in the session and cited various learning situations where a book can do wonders and help children in decision making & choosing the correct path. She emphasised that parents must read to their children right from their childhood as every new book opens a new world to the child. She displayed & shared interesting titles on Maths fiction, grammar fiction and other social issues like gender equality. She even presented wordless books which had only images and can be used for story telling in various regional languages. It was suggested that students must be encouraged to do silent reading for at least fifteen minutes every morning. The session ended with a conclusion that reading skills can be honed if students have access to books and other reading material right from their play schools. The informative workshop was divided into three sessions. In the first session, Teachers were apprised to quantify learning of pupils which is really important to fulfil the learning objectives. What are learning outcomes and the pedagogy to achieve desired learning outcomes were discussed. In the second session, Dr. Anoop gave an insight to how student centred learning helps retaining knowledge better. How a teacher should adopt a technique to teach students from whole to part was also an interesting and useful tip discussed. The third session was taken in respective classrooms by different resource persons for each subject namely Maths, Hindi, English and EVS where teachers actively took part in group discussions and also had an interactive talk with the resource person focussing on the challenges a teacher faces during subject teaching and ways to deal with them effectively. The key words to design learning outcomes were listed. Teachers got a chance to design their own learning objectives, decide corresponding pedagogy and also to select the learning outcomes based on the keywords mentioned to them taking any topic of their subject. This helped the teachers to practically apply their learning. The session ended with boosting up teachers with a new zeal to provide a better learning environment for students and to quantify assessment of learning. A Workshop on First Aid was organised on 14 March 2017 for the teachers of Primary Department. Around 30 teachers attended the workshop. Conducted by Dr Debashis Dhar Senior Consultant, Department of Critical Care and Emergency, Sir Ganga Ram Hospital, the workshop aimed at disseminating information about the techniques of administering Basic First Aid and training in Health Care. Dr Dhar discussed the causes, symptoms, and first aid to be given in several health conditions ranging from common to critical, such as Asthma, Seizures, Fainting, Nose Bleeding, Abrasions, Fractures and Sprains. Different splints and method of using them was also explained. Critical Conditions like Cardiac Arrest and Choking; and the technique of giving compression; mouth to mouth and bag mask ventilation to revive a patient were also demonstrated using a human sized dummy. He also discussed the use of AED- Automated External Defibrillator. Mr. K C Singh, former Ambassador Secretary, Ministry of External Affairs. On 27 January 2017, the School hosted a workshop for teachers of French, organised by Rachna Sagar Educational Publishers. It was attended by 60 teachers from schools in Delhi NCR. The resource person, Dr. Kiran Chaudhry, Professor of French, Jawahar Lal Nehru University, Delhi focused on different forms and activities of grammar feasible in an Indian classroom; and the latest techniques and methods for teaching French as a foreign language.